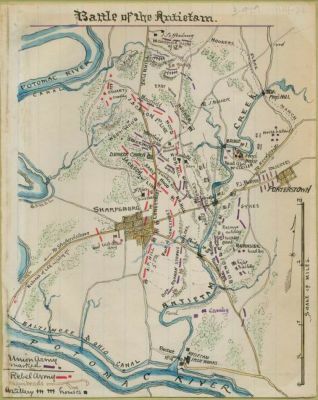 Conveys the placement of Union and Confederate forces in Washington County, Md., around Sharpsburg during the Battle of Antietam on September 17, 1862. Robert Knox Sneden scrapbook (Mss5:7 Sn237:1), Virginia Historical Society. In the Robert Knox Sneden diary, 1861-1865 (v. 3, p. 929).